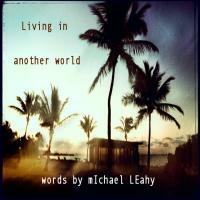 Michael Leahy says it with words - and a little music! March 06 Dear all, for the past few months all the action has switched to A-Lyric.com - the new home of the Accidental Lyricist. I post news, links, commentary and occasinally some music. So can I recommend that you drop by and bookmark the site? I think it's often quite fun. You'll also find all the old interviews that I posted here. Sept 22 2005 - I was just reading about how Barbara Streisand gave up live performances 27 years ago because she forgot the lyrics to 3 songs on stage at Central Park. Is that all? Surely someone should introduce her to cueing screens. The Stones use them, after all. And they write their own material. It's a bit odd, but it happens to everyone. July 22 2005 - I've been talking with reggae grrrl Sophie Mika again about the possibility of doing some stuff together in the near future. We go way back. Sophie is one of the many artists that have decided to go ahead and do her thing without waiting for a label to come along. So she tours consistently and releases her own stuff. Her latest single is "Borderline", featuring Omar Perry (son of Lee). March 25 2005 - Well now, I'm feeling pretty chuffed. Just got word that "Angel" will be Track of the Day on Garageband.com tomorrow, Saturday 26 following some pretty enthusiastic reviews! "Angel" was written with Kris Kristoffels a while back. This version was arranged by Herman Martin, with Muzzy Horn doing some tasteful guitar and growly vocals. March 13 2005 Interesting news item in Money Plans, of all places. Researchers at Dartmouth College have been playing around, seeing which parts of the brain are used when people listen to music. They monitored brain activity as people listened to music, and then checked which parts of the brain were used to fill in the gaps when they blanked out extracts. The conclusion is that "lyrics might be the focus of the memory". Feb 25 2005 - Starting from scratch. It's inevitable that after you do anything for a while, you learn some reflexes. So you listen to music searching out the key turning points in the melody and already get a picture of what you want to say - however vague. But what happens when someone strips you of your habits? This happened recently when singer Marka got back to me. Years ago, we wrote a song together in English. Since then, his career has taken off in France. So when looking around for new material, he dug out the old tune and adapted it into French. Being a lyricist, I immediately started saying "Yes, but..." about different words he was using. "OK," he said, "You clean it up." I speak French and thought, "Sure". But when it came down to it, I was like a total novice, as if I had never written a word to music in my life. Argh. The song has been patched up, and he is currently working on it in Bordeaux. This is one song that I am curious to hear!